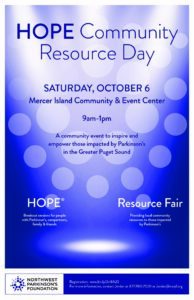 Join us for HOPE Community Resource Day! This NW Parkinson’s community event will include a resource fair and educational presentations. The resource fair will offer programs and services from various organizations that encompass the dynamic needs of our Parkinson’s community. There will be featured presentations that highlight the latest Parkinson’s research, treatments, medications, programs, and more. Come spend time with friends, old and new, and learn about what resources can further enrich your life.